Wendy offers a variety of planning packages with a range of professional services tailored to the unique needs of the student and family. Packages culminate in a well-structured plan that breaks the process into manageable tasks and preserves family harmony. Wendy begins working with students as early as 9th and 10th grades to develop a strategic plan that will maximize personal growth and optimize the high school experience for college planning purposes. For families who choose a comprehensive plan for 11th and 12th grades, consulting services during 9th and 10th grades are provided at a reduced hourly rate. 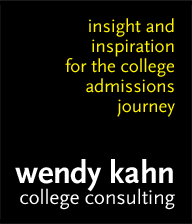 This meeting is provided to explain how colleges make admissions decisions, the benefits of working with an educational consultant, and ways Wendy can help your child with the admissions process. Wendy offers hourly consultation services. Clients may also purchase a pre-paid multi-hour block of time to be used for any service. A long-time volunteer in Jewish educational institutions, Wendy understands that the backgrounds and requirements of Jewish students vary. What's a "great" Jewish community differs from student to student. To help her Jewish students find the communities that are right for them, Wendy meets regularly with Hillel directors and student leaders to learn about Jewish life and the broader culture on their campuses.